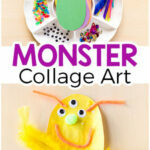 This winter art project is perfect for toddlers and preschoolers! 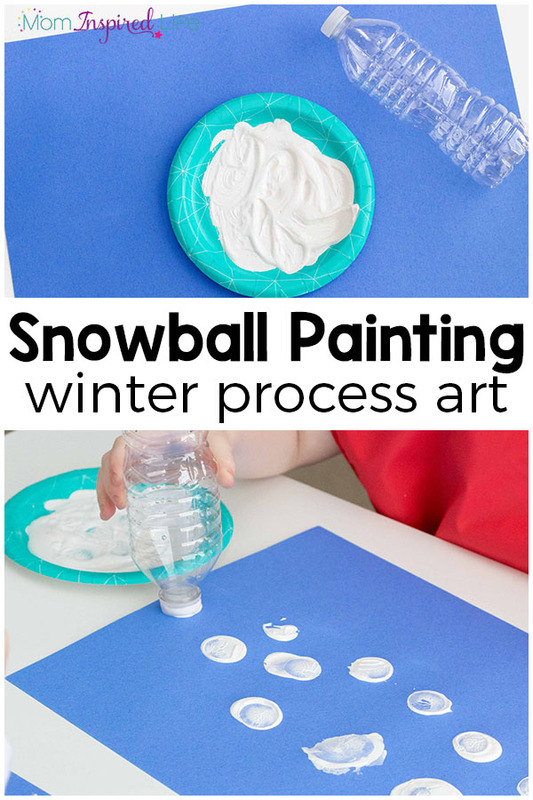 It’s a fun, winter process art activity that uses an unexpected object to create snowballs with the paint. 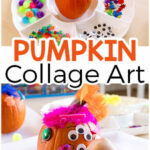 My kids love painting and I love finding new ways to make it fun and exciting for them. 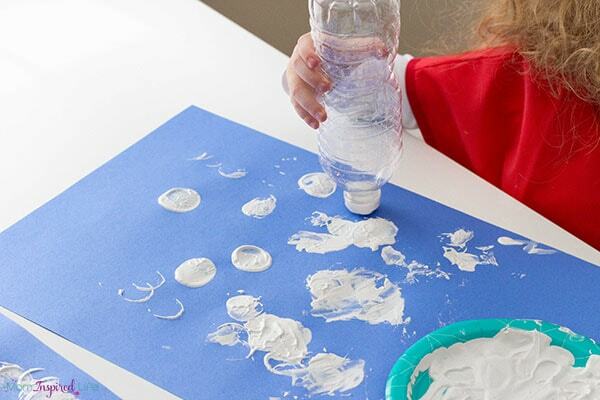 This winter art project fit the bill perfectly! 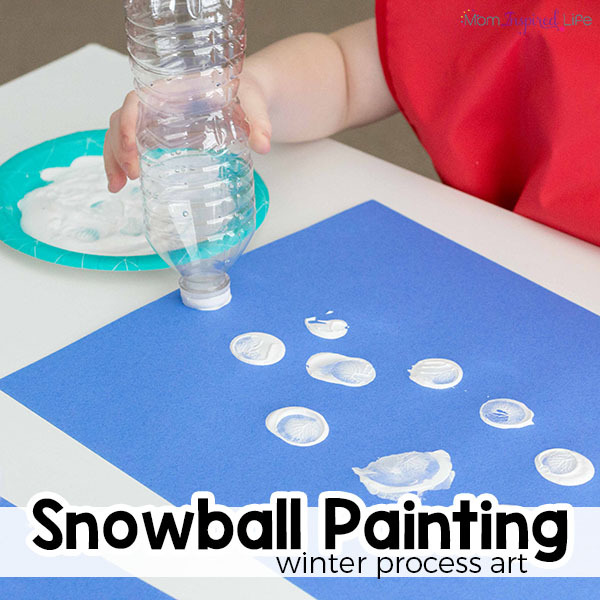 They had so much fun painting snowballs. The paintings look lovely hanging right next to our melted snowman collages too! 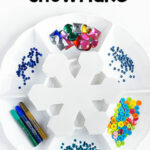 Plus, we did this crazy fun snowflake art project that my kids LOVED! Now it looks like winter both outside and inside our house. 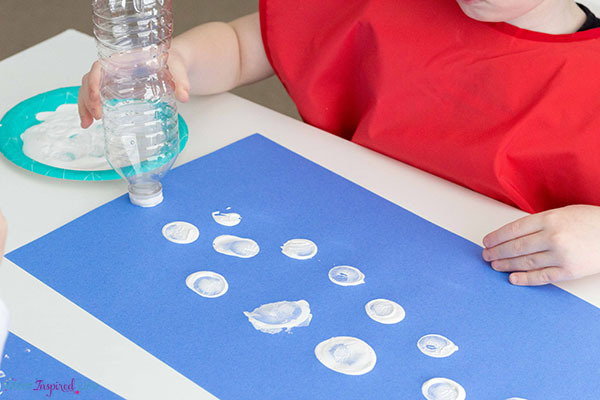 I showed the kids that they could dip the bottle cap end of the water bottle into the paint and then press it down on the paper. The white circles looked like snowballs. They thought that was too funny! My 5-year-old made a bunch of snowballs, but then wanted to paint a cloudy sky. He also grabbed some crayons and adding some drawings to his painting as well. I love seeing their individual personalities come out through their creativity. 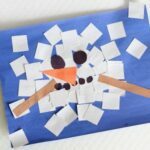 A winter art project like this is a fantastic way for kids to express their individuality and creativity! 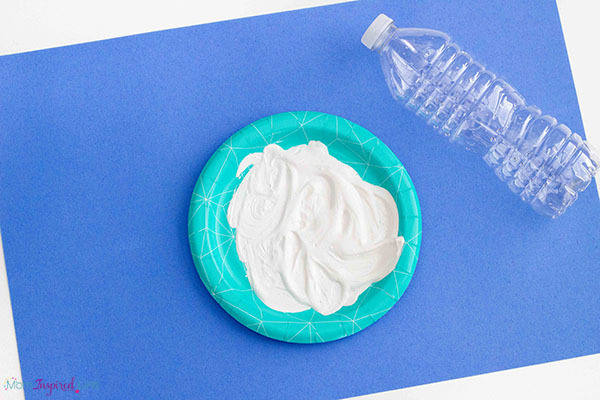 I put a squirt of paint on a plate and gave each kid a sheet of construction paper. Then I gave each child an empty water bottle. How’s that for simple?! 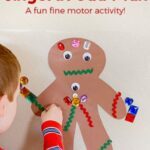 This winter art project is quick and easy to set up that I am sure we’ll be doing it again this winter. 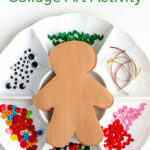 Check out these other fun winter activities for kids!